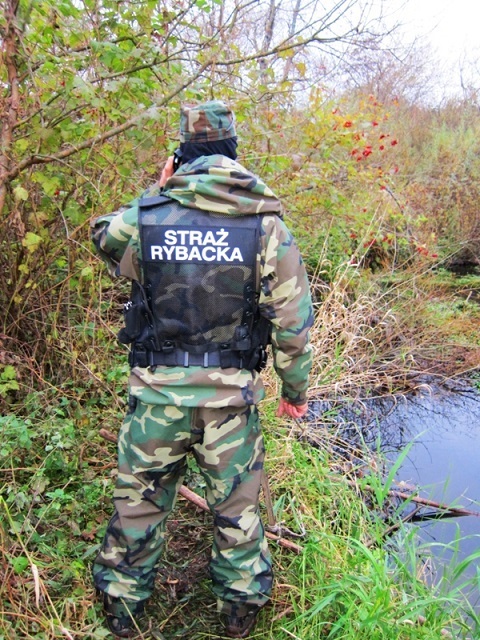 The OSA is a voluntary fisheries enforcement organisation, specialising in the protection of game fish, in a small area of Poland, concentrating on two rivers – Parseta and Wieprza. This is just one of many similar organisations throughout the country. Angling Trust Building Bridges Project Manager, Rado Papiewski, contacted Andrzej Zawłocki, one of the organisation’s founders, who has kindly answered a number of questions concerning the rules and regulations governing angling in Poland. Historically, it has been believed in the UK that there is no concept of private fishing or licensing in Poland – and it was this that Rado needed to clarify. ‘Commercial fishing is a problem. These are fisheries where fish are caught and taken, by rod and line, for food; it is, in fact, an offence to return any fish to these waters alive. Obviously anglers fishing such venues have to pay to do so, and for the fish they catch and take away. So, if you don’t want to pay a lot, you have to stop fishing when a certain number of fish have been caught, because unlike in Britain it is unlawful to continue fishing but return catches after so many have been caught. AZ: ‘Before anyone is able to fish, they have to take an exam. This is administered by local government and concerns size limits, health & safety, and general angling law. This effectively leads to provision of a lifetime “passport”. Foreigners and under-fourteens are exempted, but the latter can only fish under the supervision of adults in possession of such a passport. ‘On waters managed by PZW, an annual fishing permit is also required, for which a fee is payable. On these waters, the rules and regulations are known as RAPR. These detail the limits of fishing, times when different species are protected, size limits and permitted methods. These rules are a component of legal byelaws. The fishing permit’s price, though, is inexpensive, which does not, therefore, deter the irresponsible. However, the passport enables an angler to fish nationally, in every region, providing he or she is also in possession of the appropriate regional permit. What this means, therefore, is the passport is similar to a rod licence in England, and the regional permit enables fishing in any PZW water in that particular region. To fish another region, another PZW regional permit is required. This, however, means that you can fish any PZW controlled water in any region for which you have a regional permit. To fish waters not controlled by PZW would require a separate permit, issued by the individual owner. Each regional permit costs around £50 per annum, but this is not enough, given how much water is available’. AZ: ‘Poaching is definitely a big problem in our country. Increasingly this is backed by organised crime, criminals who use efficient modern methods to kill large numbers of fish. The most deadly method is electro-fishing, that kills also fry and other organisms in the water – even birds. This has a very negative environmental impact. 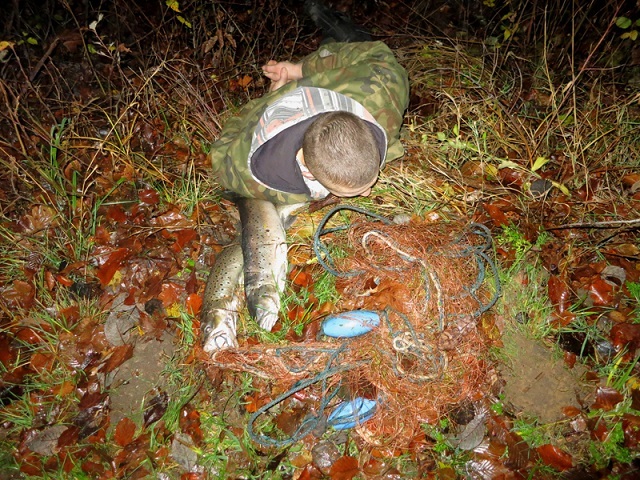 Last year we caught an electro-netting gang, who had caught 35lbs of brown and sea trout in just a few minutes. According to our intelligence, this gang had been very active, in the last year killing several hundred pounds of migratory fish. 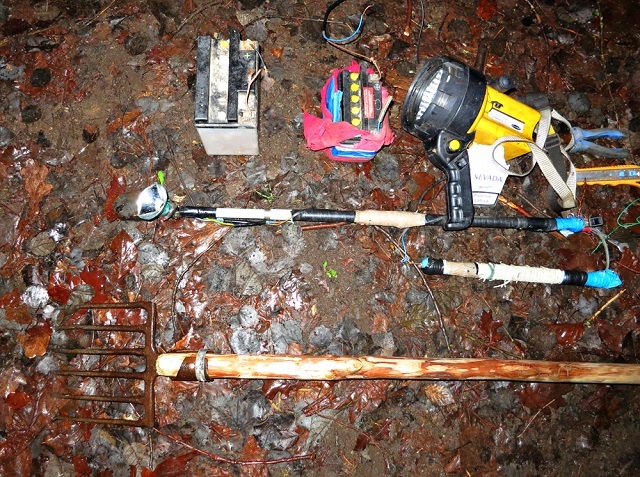 There are many of these gangs, largely confining operations to their local regions. Setting nets is also very popular. These are set during the upstream migration of salmon and sea trout. Annually we find many nets of various lengths, from two metres on small streams, to twenty on big rivers, and fifty on stillwaters. We also have problems with unethical anglers who have no regard for size limits or legal licences. Although they are not as destructive to the environment as the organised electro-netting gangs, this is still another big issue. In total, we estimate that all kinds of poaching in our particular region alone, are costing us in excess of ten tons of fish per annum’. Check amount, size and weight of fish caught. Seize and secure items used in the commission of offences. Provide receipts for items seized. Refer offenders either to club disciplinary committees or police as appropriate. ‘That, at least, is the theory, which in practice is slightly different. The national professional enforcement organisation is ineffective and arguably exists only on paper. My information is that there are only 400 full-time paid fisheries enforcement officers in our entire country. Officers are low paid and are insufficiently equipped and resourced. Personally, as an angler, I have not seen an enforcement officer during the last twenty years. Our voluntary groups, therefore, are playing a vital role in increasing the level of fisheries enforcement in Poland. In the OSA, we have 15+ volunteers, and we only work in a small part of our county. I predict that in the whole county there are 500 SSR – members and many thousands nationwide. The majority of these are committed with checking permits, because they are not trained to target organised crime. In fact, few volunteers would wish to get involved in a fight with organised gangs, which could be very dangerous. All volunteers, however, enjoy the same legal protections as police officers – so if assaulted, the offender could be imprisoned for up to three years. Our OSA, though, is trained, equipped and ready to fight organised poachers. We have young, fit and well organised guys, and our main job is to catch offenders and hand them over to the police. In the last three years we have caught and handed over more than fifty offenders’. AZ: ‘The SSR – members, have to satisfy a particular criteria: be aged over eighteen, no criminal record, and pass an exam (an extended version of the fishing passport test). If successful, they receive an identity card and badge, and initially work with more experienced colleagues’. ‘Regarding the OSA, each applicant is taken on for a probationary period of at least six months. In that time we check the volunteers’ knowledge of legislation, and assess their behaviour in volatile and stressful situations. Additionally, they have to demonstrate commitment and that they will be an asset to our group. Finally, the OSA committee has to approve their appointment’. AZ: ‘The professionals have the legal right to do anything within reason to prove an offence. They can check identity, search persons and vehicles, secure evidence, and take the offender to the police. Volunteers have no power to check identity or search. They cannot perform stop checks, but they can detain the poacher, call the police to attend and take the offender into custody’. AZ: ‘These are only partially funded by the authorities, which only contributes around 10%. Groups established by local councils receive some money from the PZW. We often receive donations from conservation groups, and local commercial fishing authorities. Our OSA receives the biggest public support – we often organise internet auctions, selling hand-made lures donated to us by manufacturers. We also have to cover various costs from our own pockets, for petrol in particular’. AZ: ‘Unfortunately, the Polish justice system is reluctant to deal with the issue, because it is so widespread. Frequently, sentences are too light and are not a deterrent. Although maximum sentence is up to two years’ imprisonment, in most cases offenders are only given a few hours community work, and prison would only be a last resort for a persistent offender. Fines are low, and in no way proportionate to the offence. Often, therefore, we are constantly dealing with repeat offenders. Fines only take into account the market value of fish, which is in any case low, and not in any way the negative environmental impact’. RP: ‘Thank you very much – all of this is very helpful and interesting’. AZ: ‘We are very pleased to now be in communication with the Angling Trust, and to learn more about how you are approaching similar issues in England. 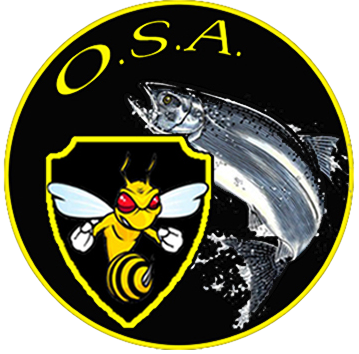 We would like to let anglers in England know about our website (www.osa-parseta.pl) and find us on Facebook at www.facebook.com/osa/parseta. ‘There are clear parallels here between our frustrations and problems in England, and those being experienced in Poland. In the Netherlands, fisheries enforcement is almost entirely delivered by a voluntary service, and here in England the Angling Trust is running the Voluntary Bailiff Service in partnership with and in support of both the Environment Agency and police. The fact that volunteers are being used in this way and, indeed, in various countries, perhaps suggests the low priority given to fisheries enforcement – meaning that the professionals are insufficiently resourced. The very fact that so many anglers have volunteered to help in England, Holland and Poland is a clear indication of the dissatisfaction with the existing arrangements. Clearly, more resources are required and this is why we need to turn to a degree of self-help – but this must not be vigilante, it must be delivered entirely responsibly, in our case, in partnership with the Environment Agency in particular. Our sympathy is with our Polish friends, whose frustration we can fully understand and relate to because of the issues experienced here with both certain migrant anglers and our own Criminal Justice System. There is no doubt that organised crime also has a role in offences here in England, which is one reason why our respective intelligence networks need to communicate, cooperate and share information. Moreover, we all need to work together, sharing ideas and examples of Best Practice to ensure that fish and fisheries are protected in all of our countries – and that fisheries enforcement volunteers stay safe. The fact is that volunteers now work in innumerable capacities within the police service and other areas of the public sector – the Voluntary Bailiff Service is here to stay, is making a difference – and we look forward to supporting and cooperating with our counterparts in Holland and Poland’. nice very nice keep up the good job !